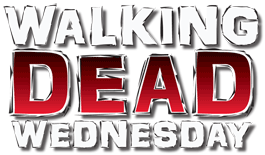 Tee up the Walking Dead Wednesday! Walking Dead Mystery Minis Series 3 takes its characters from all over the place. Hershel lost his leg in Season 3, but had a prosthetic by Season 4. Meanwhile, all the zombies are from after the fall of the prison, and that happened in the middle of Season 4. This one, for instance, appeared in Season 4 Episode 12, "Still" - you know, the one where Daryl and Beth start to bond (because they're the only people in it)? Beth wanted to drink alcohol, since she'd never had any, and decided that the Pine Vista Country Club would be the perfect place to find some. Which it might have been, if there hadn't been a class revolt that left the place full of high society zombies. The Golf Club Walker is based on the last one Daryl killed during his rampage, most easily recognized by its teal sweater. He's also got khakis and golf shoes with actual sculpted and painted studs on the bottom to suggest spikes! 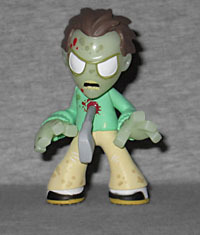 Granted, that zombie was killed by having half his head putted off by a club, while this toy has a club sticking through his torso, but the idea is clear. And while we're on the subject, the walker on the show was an old man, with white hair - the original design for this figure, as seen on the box art, followed suit, but the final product has light brown hair. The normal figure is quite plentiful, packed in a 1:12 ratio, but there's a variant that's only ⅓ as common - the 1:36 glow-in-the-dark version. The skin is a bit more waxy than the pallid tone used for most of the undead, but it's still similar enough that he won't look out of place among them. The glow isn't the strongest we've seen on a toy, but it's pretty good, and the blood and dirt painted on his skin breaks things up and keeps the toy looking interesting even in the dark. 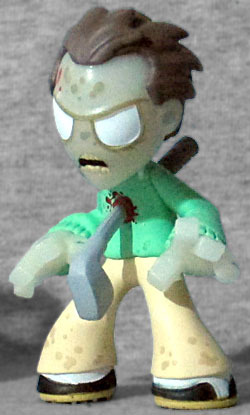 This entry was posted in blog exclusive review, Funko and tagged GitD, Mystery Minis, zombies. Bookmark the permalink. I gave both versions of this guy to my aunt, too - it's nothing against the TWD minis, because they are AWESOME, but she's obsessee with the show and loves the mystery minis And she was in a really difficult job situation, so I went out of my way to give her a metric ton of TWD stuff for her birthday. Golf club guy is absolutely awesome, though. I did end up keeping one walker - the female one based on that woman who pretended to be a zombie (before becoming one). You know, the figure that looks like the ghost from The Ring. I'm slowly getting replacement mystery minis now. The thing about these and PoPs is, they make insanely good gifts for people.